Equip your medical facility with topnotch professional and patient-use garments and linens only from Medico Professional Linen Service! We offer nothing short of the best quality linens to ensure durability and wearer comfort, maintained to the highest standards in medical laundry. Medico has over 80 years of experience specializing in the care and maintenance of crucial linens used in medical facilities of all sizes. We have assembled the finest selection of medical linens, hand-selected for the quality of material, excellence in construction, and durability for wearer comfort and optimal use. 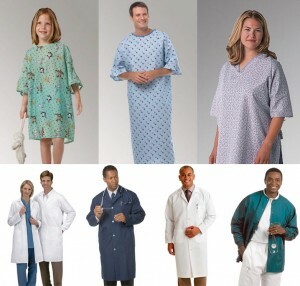 Medico is also your number one provider of expert care needed for hospital-use linens. We use innovative technology in sorting, handling, laundering, and storing medical linens and are in compliance with industry standards to provide the strongest defense against cross-contamination. At Medico, we guarantee you clean and safe linens that are comfortable to use and maintained to withstand the demands and needs of the medical community. Medico is an HLAC-accredited, certified Hygienically Clean laundry facility that employs topnotch quality control standards with an impressive 80+ year history in this specialty. We have the expert care and superior standards so you can rest assured that your healthcare linens are in the best hands in the industry. Contact Medico today and experience the difference that has set us and our healthcare linens apart from our competitors! Call 800.464.6334 today to get started or to learn more about what we can do for your facility.